1730 Russia: Tsar Peter II dies of smallpox on his wedding day; his new wife jumps into his deathbed in a futile effort to become pregnant. It takes a little more than just getting into the bed, and it helps if the guy is actually alive. 1733 Polish-Lithuanian Commonwealth: August II the Strong dies, having fathered over 300 children during his life. 1766 Denmark & Norway: Christian VII becomes king; probably schizophrenic, his reign is debauched and scandalous. But oh, SO much fun! We got power back after about 21 hours which meant no TV, Internet or land line telephone. The great storm was essentially a wind event here in southern New Hampshire. We were lucky in that the trees that fell did so on the edge of the woods and fell away from the house. The rain during the storm itself was no more than a heavy drizzle -- the heavy rain is coming down now during an evening of thunder storms. During the power outage, the "Indoor Generator" I bought last summer (actually a high capacity marine battery backup system) kept the fridge, deep freeze, water pump and on-demand water heater, and about half the lights and outlets in the house working, making it worth every penny of its cost. 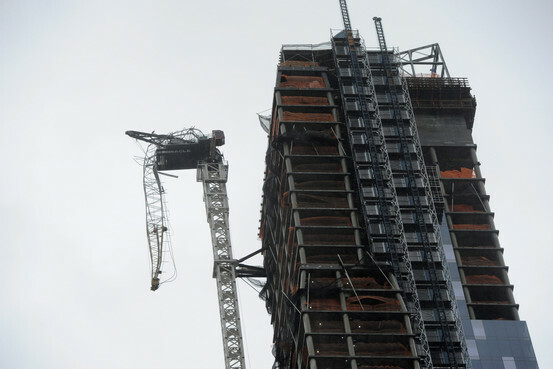 You've probably seen this, but in addition to the massive flooding of subways and tunnels New York has endured the drama of a wind-wrecked 50 ton crane, its massive arm dangling partially detached over 57th Street between 6th and 7th Avenues. The building under construction is a luxury condo that recently pre-sold two of its units that are believed to be the most expensive ever sold (at least in the U.S.) at $90 million each. The crane is up around the 900 foot level on a building that will top out at 1004 feet. The street is lined with residential buildings, office towers, and the great historical and cultural landmark, Carnegie Hall. When the enormity of the problem was realized, the city's officials urged people living on upper floors of the residential buildings to evacuate down to the lower floors. Considering the massive destruction that would happen if the crane arm dropped from almost a fifth of a mile high, I wondered if that was the best possible advice. Since then hotels and residences have been evacuated but nobody yet knows how long the crisis will last. As of tonight, the dangling arm hasn't dropped. Engineers have said that the only way to deal with the situation is to strap the arm to the building and dismantle it piece by piece, then build a new crane in place to finish the building. 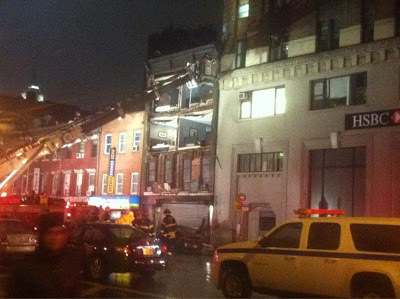 On a vastly smaller scale but dramatic enough in its way was the collapse of an apartment building facade in the Chelsea neighborhood during the height of Sandy's winds. I hope all of you made it through OK without damage or injury! This painting showed up on a Facebook page with no information as to the artist or date it was painted. 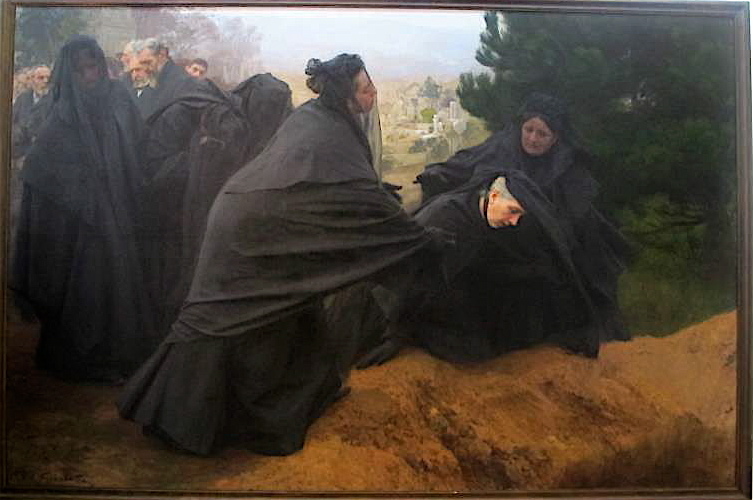 Given the general style, the clothing and the highly sentimental, even melodramatic subject matter, Fritz and I estimated French and late 19th century (1870s-80s). If anyone knows the painter and when it was done for certain, please let me know. By the way, the painting is approximately six feet high by nine feet wide (estimated by the figure of a viewer standing next to it who has been cropped out). 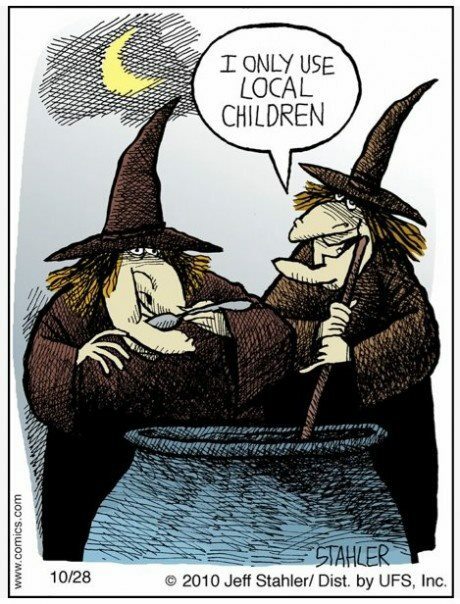 The Buy Locally, Organic Witch. Happy Halloween! I'll run out eventually, but they've been a lot of fun. Boo ! don't fall off the broomstick this year! Tell Fritz we are having his cheese soup for Halloween dinner. Glad your only arboreal casualties were well away from the house. David, even when Obama suffered that dip in support after his poor showing in debate #1, the important standing in the Electoral College votes was still in his favor and seems to be growing as we go into the last days of the campaign. 21 hours without power isn't bad. We went most of the week. Amazing how close we are to our living-in-caves days. Just take away our electricity, and things start grinding to a halt! I'm glad to hear you went relatively unscathed through the storm!